Tensile strength of dry basalt rovings and yarns is one of the most important parameters regularly controlled at our factory. This parameter is also called “tenacity” and is measured in mN/tex. However to achieve the above values in your laboratory tests it’s necessary to thoroughly follow our testing procedure. Due to the fact that basalt fiber is stiffer and more brittle than glass fiber,preparation of specimens for evaluation of mechanical properties should be more careful. 1.1 Clamping faces of jaws must be thoroughly fitted to each other to provide the maximum contact area. 1.2 In order to prevent specimen slipping from the clamps it’s allowed to glue leather or polyurethane pads on internal faces of clamps. Sandpaper with very small grit size also may be used (grit size – less than 40 µm, ISO designation -P400). To avoid elevated brittleness of impregnated parts of specimens the bonding mix consists of epoxy resin ЭД-20 (ED-20) with addition of acetone first and then subsequent addition of plasticizer (dibutyl phthalate, dibutyl sebacate) in the ratio 100:10:10. Mixing and applying are performed with a brush. 3.1 When testing in jaws, the length of fiber segments should be not less than 220 mm. Preliminary it’s necessary to remove 20 m of yarn from each package and 1-3 m of yarn should be removed between segments. 3.2 To prepare specimens for testing a paper template is used. Specimens preparation activities are performed on a fluoroplastic pad. 3.3 Apply a sufficient amount of bonding mix with brush. 3.4 Place the fiber segments in the center of strips and straighten them thoroughly. 3.5 Apply one more layer of bonding mix, gluing the fiber to the paper. Remove minute air bubbles from impregnated part of fiber by tapping with a brush. 3.8 To provide even distribution of bonding mix between monofilaments, specimens should be kept in the air under natural conditions during 2 hours. 3.9 Then the specimens are cured at 107±2°C during 1 hour. After heat treatment the specimens are temperature-stabilized during 1 hour under natural conditions. 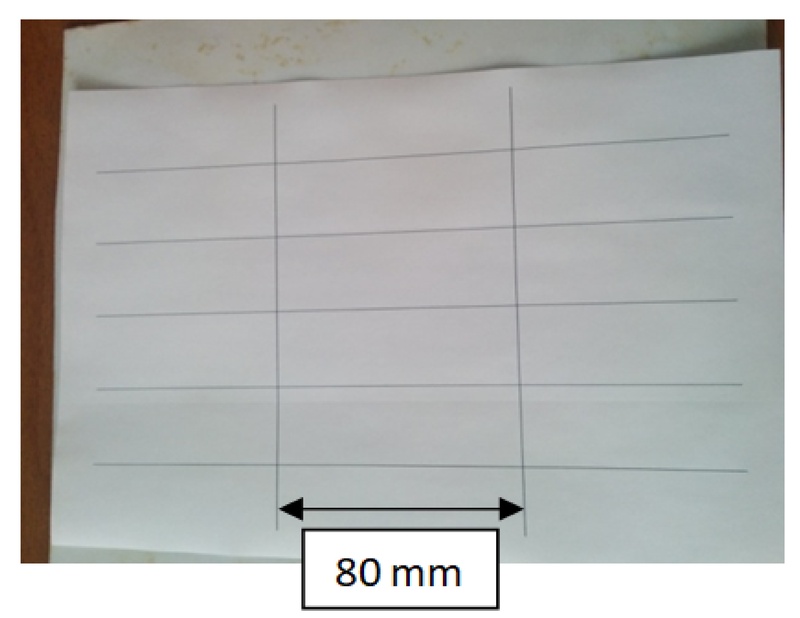 4.1 Paper template with specimens should be cut as shown in Fig. 17 (after cooling-down during at least 15 min). 4.2 When testing in jaws, a specimen with paper tabs is mounted precisely in the center of upper clamp of tensile machine so that 8-10 mm of impregnated part is out of jaws. Fix the specimen in jaws. Then mount the other end of the segment, straightening and pulling it carefully by hand. When mounting in lower clamp, special care should be taken: don’t bend the yarn and don’t touch unimpregnated part of the specimen. The distance between the clamps is 100±1mm. 4.3 Before testing cut the paper carefully behind the yarn with scissors without touching the yarn. 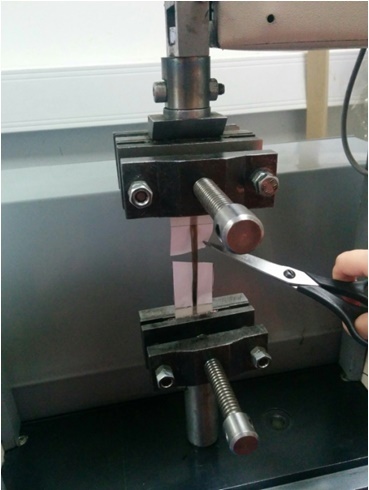 When clamping the specimens in jaws of tensile testing machine, it’s necessary to avoid their bending.